Never saw this name coming. UPDATE: The press conference finally ended just after 8 p.m., with the revelation that the PS4 will be released “Holiday 2013.” No images of the actual console and alas, no pricing info. Dang. After months of breathless anticipation and whispered rumors of what the next Sony game console would be called and what it would do, the wait is over. 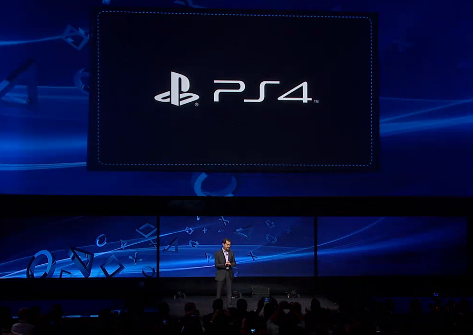 Sony President and Group CEO Andrew House unveiled the name and its… Sony PlayStation 4. Ta da! There had been rumblings of exotic names like Orbis, the reported code name for the next generation console. But during tonight’s press conference, House dropped the name after a lengthy preamble. The whole thing kicked off with a long hype video, equating imaginations with weapons and patting us all on the back for doing our best in the fight. House took the stage and teased the idea of Vita moving toward the living room, and stressed the importance of consumer demands in what Sony is doing. He said he was there to give us a “glimpse into the future of play,” before putting the name out there. Next up was Mark Cerny who went into more details about the new console, saying architects wanted to focus on keeping gamers connected to their games and listened to developer feedback. He unveiled the new controller, which includes the buzzed about touch pad, a new light bar to better ID individual players, a headphone jack for talking to fellow players and a “share” button. It works with a stereo camera that tracks its position and player. Something else kinda cool — Cerny says the system downloads just bit of the info needed to play the game, while the rest gets downloaded in the background as you play. He also showed how users can tag and share videos of your play as you continue along, which will basically let your friends watch what you’re doing while you’re doing it. As he points out, if you see during live watching that your friend is in trouble in his or her game, you can swoop in via the network and offer to take over the controller and help. They’re working with Hulu, Netflix and others to provide content on PS4, but more on that later, apparently. A whole slew of games were also unveiled as well, including a teaser that another Final Fantasy is probably out there, somewhere. Next You Think You Can Just Scoot Into Walmart & Set It On Fire While You Shoplift? Nope. Next Up: You Think You Can Just Scoot Into Walmart & Set It On Fire While You Shoplift? Nope.